On 21 July 1969, two NASA astronauts accomplished one of the biggest achievements in the history of the world: they became the first men to set foot on the moon. The astronauts’ companion on the lunar surface was a stunning Omega Speedmaster, which was strapped to Buzz Aldrin’s spacesuit; now, half a century later, Omega has released an anniversary piece to mark this horological moment. The Speedmaster Moonwatch Apollo 11, limited to only 1,014 pieces worldwide, is a fitting tribute both to the mission’s lasting legacy and to the Speedmaster collection. One of the most emblematic collections, the Speedmaster was first introduced in 1957, where it immediately gained a reputation for its incredible precision, ease of use and reliability. The Speedmaster family also represents Omega’s spirit of adventure. Initially, however, this line wasn’t meant for space exploration; instead, it was designed as a sport and racing chronograph. The Speedmaster collection includes analogue-digital and automatic-mechanical models as well. The name of the collection, ‘Speedmaster’, comes from watches’ tachymeter scale bezel, with the original model establishing the line’s 12-hour, triple-register chronograph layout. The early models used the Calibre 321 movement, which was replaced with the Calibre 861 in 1968/1969, the type used in the Moonwatch. In 1969, the Speedmaster became known as the first watch to be worn on the moon – it’s not surprising that the Omega watches in the collection were chosen for that honour, since every Speedmaster piece is designed to be one of the most accurate and dependable in the horological world. In this line of chronograph wristwatches, the most popular piece has been the Speedmaster Professional, or ‘Moonwatch’, as it’s also known. Worn during the first American spacewalk and during the Apollo 11 mission, this watch is one of the few qualified by NASA for spaceflight and is part of the official equipment for astronauts’ Extra Vehicular Activities. Alongside other world-famous brands, such as Breitling and Rolex, the Omega Speedmaster underwent a series of punishing qualification tests to ensure it was ready for space flight, especially in the Gemini and Apollo missions – passing with flying colours. The tests included being submitted to both low and high temperatures, to low and high pressure, to high acoustic noise, intense vibrations and to different levels of humidity. According to the NASA engineer who selected the Speedmaster for the organisation’s Human Space Flight Program, James Ragan, the watch had to be there for the astronauts if they needed it. 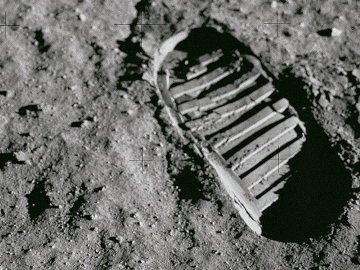 If they lost the capability of talking to ground control or lost their digital timers on the Moon, they knew they could rely on the sturdy and accurate Speedmaster. Every piece of equipment had to be on point and there was no room for error – the extremely high standards that are required for such a mission only serve to show how prestigious it was for Omega to supply trustworthy pieces that helped to time one of the most momentous achievements in the history of the world. The first commemorative, numbered edition of the Speedmaster Moonwatch comprised of only 1,014 models produced between 1969 and 1973, which Omega have paralleled in the re-edition. This exclusive piece was born in November 1969, four months after Apollo 11, as a celebratory model created for a special Astronaut Appreciation Dinner in Houston, which was held by Omega. The first two watches in the limited range were offered to President Richard Nixon and his Vice-President, Spiro Agnew, although they refused due to political correctness – the watches were considered too valuable to be accepted as a gift in such a way. The next 30 pieces were given to NASA astronauts and administrators, and to some important Swiss industry figures. The other watches were made available to the public. The Speedmaster watch presented to the NASA astronauts was made from 18K gold and offered several unique features; these historic pieces remain highly sought-after to this day. Now, 50 years after the first moon landing, Omega has produced a limited-edition Speedmaster watch to commemorate the occasion. Powered by the manual-winding Omega Master Chronometer Calibre 3861, this Speedmaster Moonwatch Apollo 11 Limited Edition piece comes in the striking 18K MoonshineTM gold. The vertically brushed step dial, also made from 18K MoonshineTM, gold includes facetted onyx hour markers. Inspired by the 1969 model, a splash of burgundy has been added to the ceramic bezel ring, to the markings on the caseback and to the movement, which is visible through the transparent back. The inner decorative caseback ring is crafted from 18K MoonshineTM gold and features a partial world map of the American continent, as well as a domed lunar meteorite inlay. This represents the proportions of the Earth and the Moon. The watch’s connection to NASA is only one of the things that make it so collectable though. The 18ct yellow gold 42mm case and the 18ct yellow gold bracelet are both stylish and comfortable, and the chronograph complication ensures incredibly high precision and performance. The onyx baton numerals and hands provide a beautiful contrast to the superb gold colour of the piece, which is further enhanced by the stunning burgundy of the tachymeter bezel. The sapphire crystal of the caseback protects the model against scratches, ensuring its longevity. The Certified Master Chronometer is approved by METAS and resistant to magnetic fields reaching 15,000 Gauss, and the anti-reflective treatment on both sides ensures maximum visibility. A watch to last a lifetime, this Speedmaster Moonwatch is perfect for anyone who wishes to wear a piece of history of their wrist. 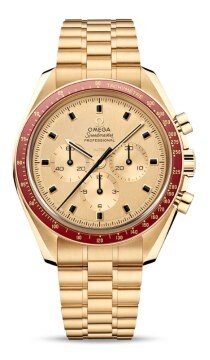 There could be no better watch to celebrate the moon landings and the Speedmaster Moonwatch’s golden anniversary. You can be the proud owner of this limited-edition timepiece by visiting Banks Lyon, so pop into our Lancaster or Kendal store to see it for yourself. Our Lancaster store manager, Myles Harrison, has recently become an Omega Grand Ambassador, so you can be confident that we know everything there is to know about this luxury brand and its stunning watches.